Clarification: Treasury Department sanctions announced last Friday do not formally designate the IRGC, which would require declaring that the IRGC is a Foreign Terrorist Organization (FTO). The authors, nevertheless, emphasize that last week's designations are consistent with such a declaration, which would be welcome for all of the reasons outlined in the article and a good first step toward formal designation. The U.S. Treasury Department announced sanctions Friday on a host of Iranian companies and individuals as terrorists. It is a welcome development, which hopefully sends a signal to Tehran to rein in its global terror support, ballistic missile testing, and oppression of its people. The action targets people and entities involved in procuring technology and/or materials to support Iran's ballistic missile program, as well acting for or on behalf of, or providing support to, Iran's Islamic Revolutionary Guard Corps (IRGC)-Qods Force. The Iranian entities operate like a network out of Lebanon. It is the base of Hizballah (Party of God), an IRGC proxy, which was designated in 1997, but the IRGC was not designated. Friday's sanctions could help liberal democracy grow in Iran by showing Iranians that their leadership would face consequences for violating civil liberties at home and international relations norms abroad. Per the Iranian Constitution (See Articles 107, 110), Iran is a theocratic dictatorship. Its parliament is under the sway of the Supreme Leader and other ayatollahs who select themselves. There is no such thing as a separation of powers by an independent authority. Iran's military is subordinated to the IRGC, which also controls most of the economy. Electoral results that do not satisfy the leadership are ignored and protests of anti-democratic governmental action are ruthlessly and systematically suppressed. In the aftermath of the 2009 presidential elections, the Greens and the National Council of Resistance of Iran (NCRI) led protests. There is evidence the NCRI continues to exist despite facing heavy persecution. But the Greens have faded away, with their leaders Mir Hossein Mousavi and Mehdi Karroubi under house arrest in Tehran, subject to the whims of Supreme Leader Ayatollah Khamenei. It appears as if Iran's leaders face few domestic consequences for their illiberal and anti-democratic rule; so, to paraphrase Burke, the fewer consequences from within, the more needed from without. A 2015 study by Israel's Meir Amit of the Intelligence and Terrorism Information Center, Portrait of Qasem Soleimani, commander of the Iranian Islamic Revolutionary Guards Corps' Qods Force, provides ample evidence of the IRGC's role in fomenting global terrorism. Starting in 2012, the IRGC recruited several thousand Shi'ite volunteer fighters from among Afghan refugees living in Iran. 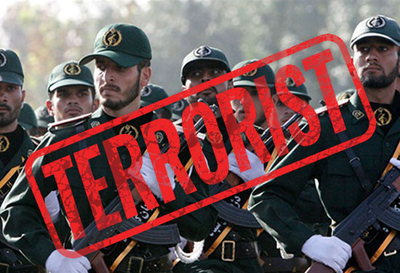 The IRGC also cultivated terrorist networks in the Golan Heights. These activities morphed into terrorism on Aug. 20, 2015, when local forces, including Hizballah operatives supported and supplied by the IRGC, fired four rockets at Israel from the Syrian-controlled Golan Heights. Two hit Israeli territory in the Upper Galilee and two fell in the Golan. Last April, Hizballah with the backing of the IRGC, began building new military installations in Syria, according to a report from the Foundation for Defense of Democracies. These appear to be geared toward a future, conventional war with Israel, but they offered Hizballah a venue from which it can launch strikes against northern Israeli cities. Deliberately targeting civilians is a textbook example of terrorism. During this same time, the IRGC helped Hizballah operate complex weapons rockets that increased Hizballah's ability to target Israeli cities. "If the enemy attacks us and seeks to take Syria or Khuzestan [an Iranian province], our priority would be to keep Syria, because if we keep Syria, we can retake Khuzestan. But if we lose Syria, we cannot keep Tehran." These three studies show the IRGC meets the legal criteria for an FTO designation. They are: 1) It must be a foreign organization; 2) engage in terrorist activity or terrorism, or retain the capability and intent to engage in terrorist activity or terrorism; and 3) the organization's terrorist activity or terrorism must threaten the security of U.S. nationals or the national security (national defense, foreign relations, or the economic interests) of the United States). To designate an organization or individual, there must be evidence they threaten the United States' national security, foreign policy, or economy. The studies cited show that the IRGC is a threat to U.S. national security interests. As evidence of congressional interest in designation, on Friday, MSNBC reported a bipartisan letter to President Trump in favor of sanctions against the IRGC. In addition, "The Iranian Revolutionary Guard Corps (IRGC) Terrorist Designation Act" was introduced in the House and Senate in January. These identical bills emphasize that the IRGC meets the criteria for designation as a foreign terrorist organization under U.S. law. "If a foreign organization looks like a terror group, operates like a terror group, and supports terrorism, then it should be called for what it is–a foreign terrorist organization," said House co-sponsor Michael McCaul, R-Texas. "As obvious as that seems, for years the IRGC has been allowed to operate clandestinely using front companies and illicit networks to evade formal designation." Fellow Texas Republican and Senate co-sponsor Ted Cruz added that, by designating IRGC as a foreign terror organization, the U.S. would be "signaling to financial institutions and companies who facilitate or conduct business with the IRGC that they may be held liable." Regarding the executive branch, President Trump made excellent choices for his national security team—Secretary of State Rex Tillerson; Defense Secretary James Mattis; National Security Adviser, Mike Flynn; Homeland Security Secretary, John Kelly; Director of National Intelligence, Dan Coats; and Director of Central Intelligence, Mike Pompeo. These talented officials need not sing from the same songbook, that is, they need not agree. But it is important that their views be taken into account in the interagency process. That said, consider two major benefits of designation their consultation might produce. First, tagging the IRGC would give succor to democratic forces within Iran by imposing costs on anti-democratic ones, including those who lead the IRGC. The IRGC leader Qasem Soleimani, who goes virtually unchallenged, would be weakened. A weaker Soleimani could give rise to splits within the regime and place Iran on its back foot. Now, Tehran can spend money abroad on Afghan fighters, Hizballah in Lebanon and Syria, Hamas in Gaza, and ignore unmet economic needs of the population. Second, designating the IRGC sends a strong signal to the Arab Gulf States, led by Saudi Arabia: Washington is serious about regime change in Tehran. Prince Turki al Faisal, former Saudi intelligence chief, spoke to a group of Iranian dissidents in Paris in July 2016. Although he was not then in the government, Prince Turki remains an influential player in Riyadh. A crowd of over 100,000 Iranian oppositionists chanted in Farsi that they wanted regime change in Iran. Prince Turki spoke to the dissidents in Arabic, saying he also wanted to see regime change in Tehran. This remark brought the house down. In a subsequent brief conversation with Tanter, Turki said that designating the IRGC would be a good start toward unraveling of the Iranian regime. The bottom line is that designation could help bring liberal democracy to Iran by weakening the grip of its key repressive institution—the Islamic Revolutionary Guard Corps and its proxies like Hizballah. Dr. Raymond Tanter served as a senior member on the National Security Council staff in the Reagan-Bush administration and is now Professor Emeritus at the University of Michigan. Edward Stafford is a retired Foreign Service officer; he served in Political-Military Affairs at the State Department, as a diplomat with the U.S. Embassy in Turkey, and taught at the Inter-American Defense College.